You guys know me, can never leave well enough alone, always doing something. Anyway been working on another project, thought I would share. 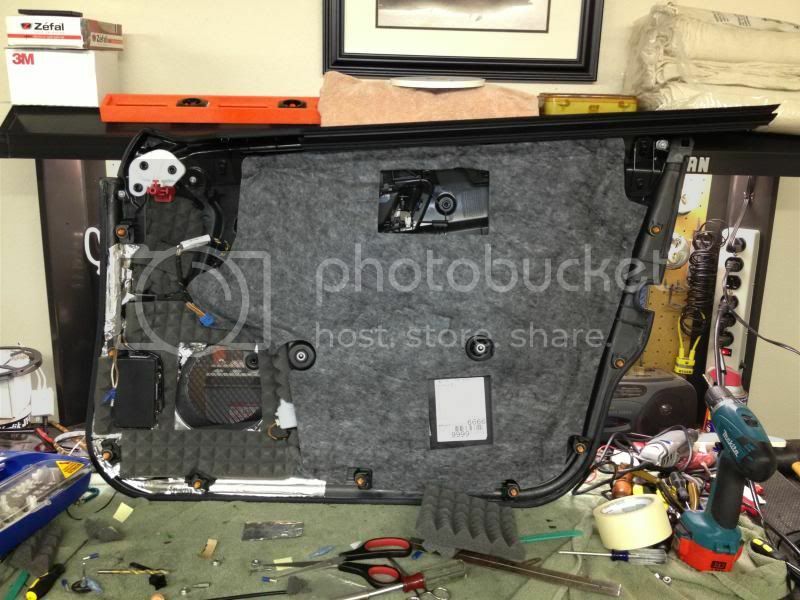 Someone gave some instructions on door panel removal from this site and thanks to them but I want to add a few specifics to make those wanting to do this feel more confident in their endeavor. Also these Doors are the easiest I have ever removed. First pop the little cover over the main screws just right under the arm rest as seen in pic. Very simple with a small flat head screwdriver as the material around the cover will sink in easily, so no scratches possible. Use a T27 Hex Head to remove the screws. 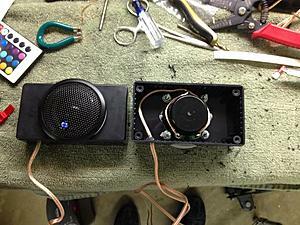 Next step is to remove the A-pillat tweeter housing. The very tip of the sail, you can pull out but you must pull away the rubber piece on the window side. Then grab and pull out. Should easily pop out from there. Now go around the door, you can use a pry tool or not. I didn't, it was easy just to pull each of the panel retainers free grabbing the edge of the door and working my way around. Okay, one tricky part. 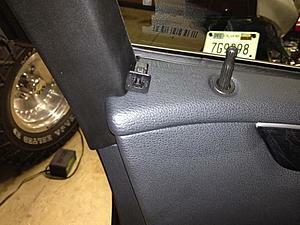 Behind the panel next to door lock(see pics below) is a square peg (fits in a square hole ) retainer. Once the panel is loose you can safely remove this slender piece out from along the window and panel trim. Just pull it away. This will expose the square peg. In the middle of the peg is a locking device. Use some needle nose pliers and just pull it out to release the lock and it slides right out. 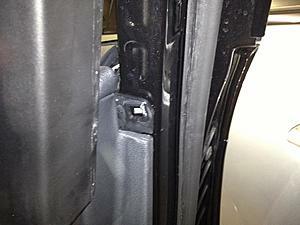 Heres a pic of the passenger doors square hole with lock removed. This is where to remove it at. Move the trim out of the way to expose it. 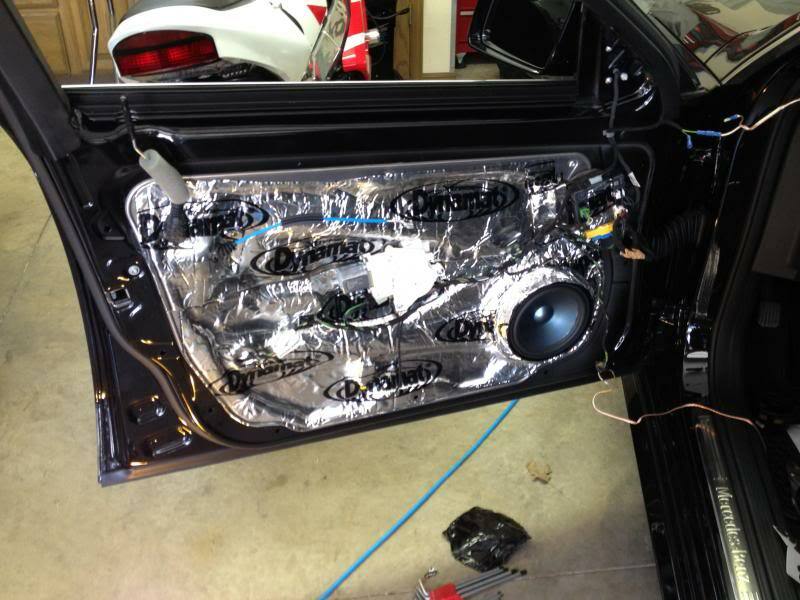 Heres what your inner panel will look like. Very solid built, notice no holes exposing inner to outer door. This aluminum is pretty thick and has a dampner ring inbetween it and the main door frame that it mounts to. This is where the build quality can be appreciated. 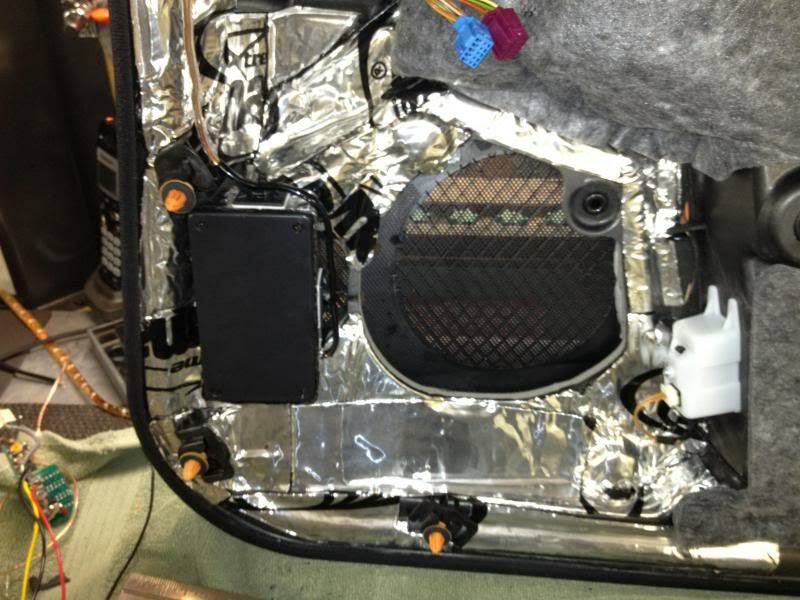 I've taken off many a door panel and nothing built as simple yet sophisticated with attention to detail paid in respect to sound deadening. Every clip touching the panel has a foam cushion between it and the panel. Of course I took it a lot further. I didn't want to bore you all with the details but I felt padded the window module, stuffed area's with acoustic foam as well as deadened the plastic trim around the window. Same panel after Dynamat Extreme applied. Double layered around midbass driver. Inner panels. Dynamat Extreme apllied on the right. I put these in the doors to replace the currect stock mids. These are the Cliff Designs CDT ES 02's. Unbelievable smooth sounding paper coned mid with upper range extension and small size. They do have to be sealed for best freq low end freq response but only require a few sq inches. 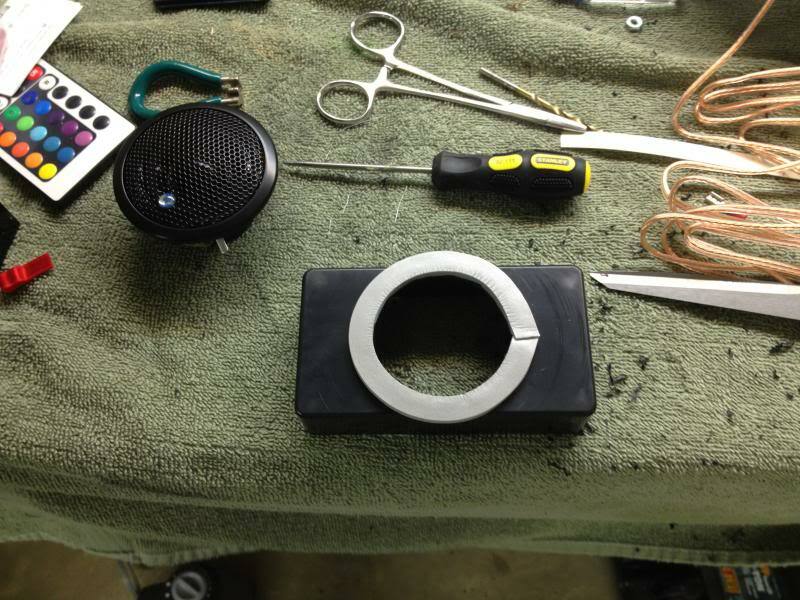 I used a "project box" with the size I needed and cut out mounting hole on one side. Poly filled it sealed it up then mounted it to stock location. Here's the final product mounted in the stock mid location. After all said and done, all I can say is Wow!!! This car is dead!!! I have some music with real heavy midbass and these panels would vibrate pretty good. I listened for an hour and had only one problem, that was the plastic trim around the window. I hit it up the middle of the pillar and now it is silent too. Sound deadening is pretty inexpensive and not too difficult to do yourself. Anyone needs any more details, feel free to hit me up. holy #$%^ !!! mercedes needs someone like you to work for them and our cars will be the best on earth! thanks a lot for the pics and write up ! I've been wanting to do this for a while but was unsure how hard it'd be to remove the door panels. Thanks for the information! Another reason I spend so much time on this forum. Thanks Brad! Small update. 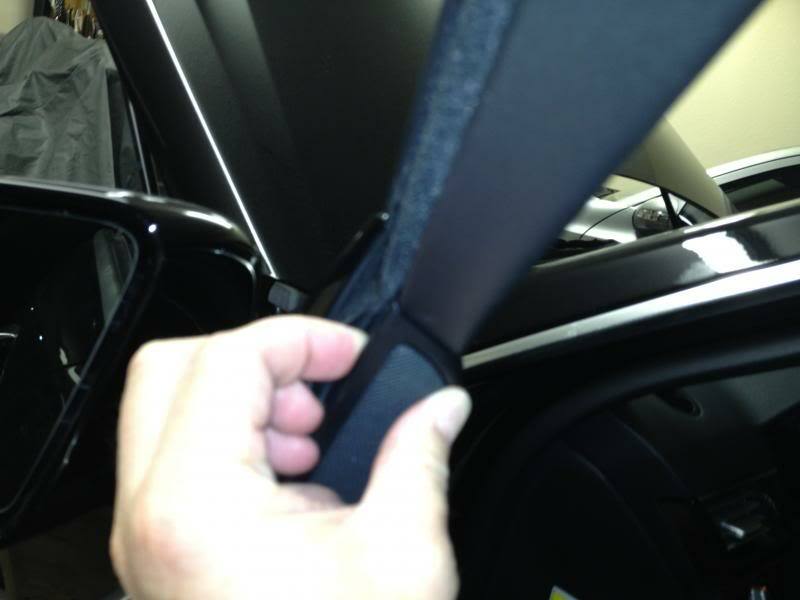 When putting the door panel back on, you will need to remove the rubber seal that is between the door panel and side window. 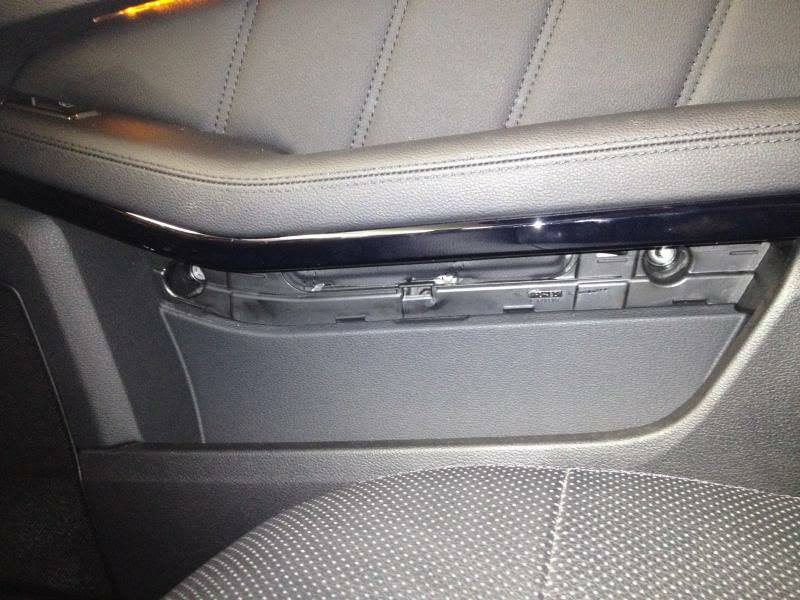 When you remove the door panel it unfortunately stays attached to the door. 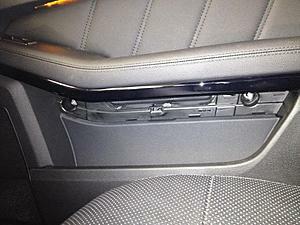 You "must" remove it from the door and reattach it to the door panel when you put door panel back on. 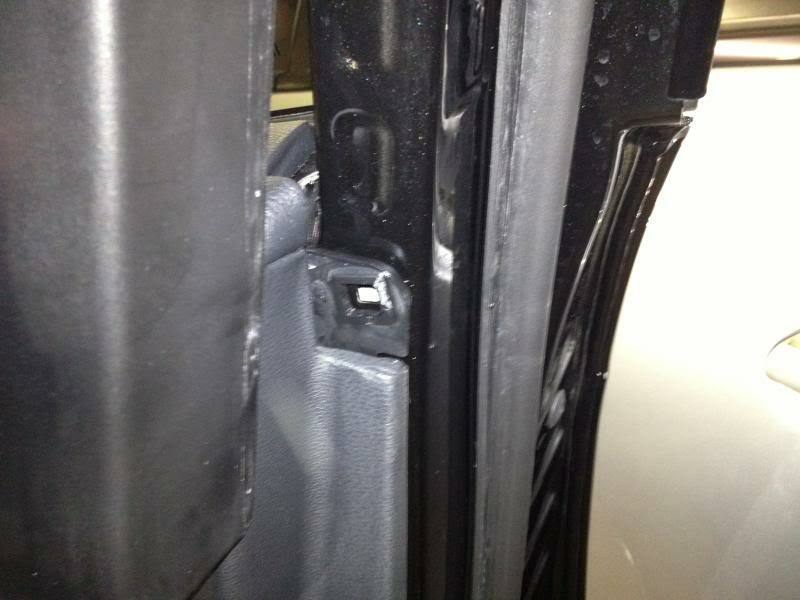 It has a channel groove and slides back on the door panel starting from the lock hole end and sliding forward. When you put the door panel on you will insert the top portion of the door panel (the seal) into the door first then it pops into place from there. 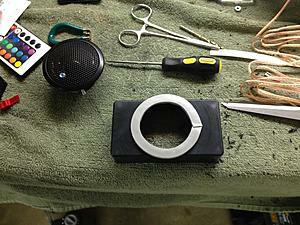 Just plug your wires in first, hook up your latch cable and make sure lock pin hits the hole. This is the top of the inner panel with the seal slid partially on. Here's a full picture. Notice the seal at the top of the panel slid partially on. OMG Hype, your sig pic is sick!!!! Love the rims and the stance. I like the concave look on the rears. Nice job on the CLS!!! Last edited by RNBRAD; 03-26-2013 at 10:09 PM. To seperate the door card from the door your going to have to drill out all the rivets. Shouldn't be too terribly hard but your going to have to replace the rivets with some kind of screw. Also if you go this route, make sure to use some threadlocker on those screws. This is awesome. If we were neighbors I would have loved to watch you do the mod. Always thought the HK system could benefit from a speaker upgrade. Aside from the audio improvement did you notice any change in the amount of road noise coming into the car? Always looking for more quiet inside. Let me get back to you on that to give you a more accurate evaluation. I've only drove my car one time since all this was done. I did however notice is was quiter while driving but I didn't really focus on how much as compared to before. I was mainly focused on the audio. I'll try to focus on that next time and see if I can't evaluate it with something measurable. I'm surprised you're rear decklid doesn't rattle. Or did you fix that already? Well I took it out for a drive the other day specifically focused on interior noise. The interior is particularly quiet anyway. I had the radio off and tried to focus on sound coming from my doors. I do have to say my front doors were a little quieter than before. Not a lot but just noticeable. I could tell the difference between sound coming through my back doors as compared to my front doors and wish my back doors were as quiet as the front. Honestly though it's not a big enough difference to do it to make it more quiet inside. If that was my goal I probably would have added more sound absorbing material versus material that absorbs panel vibrations. 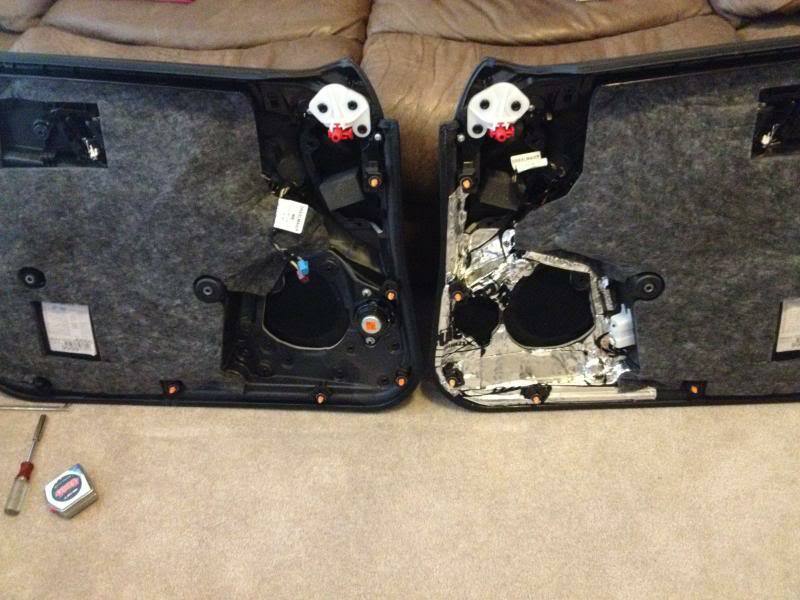 It did however improve the vibration in my doors from the midbass drivers. They perform like they are in a nice solid wood cabinet now with no hint or resonance of anything. I am noticing some other area's in the car now, nothing major but will tackle those soon. chrisv6- I'm surprised you're rear decklid doesn't rattle. Or did you fix that already? Chris, I've never noticed this before till just recently. I do have a mild vibe coming from the rear deck at certain frequencies. Of course my sub is directly under the rear deck firing through it. I will crawl back there and see if I can't pinpoint what is is. Does anyone know what the culprit is? I was very impressed with the stock deadening of the rear deck. Some pretty dense foam sandwiched between the rear decks sheet metal. Probably a piece of plastic trim, wire, 3rd brake light, etc causing it. I also noticed a small vibe at times coming from the Pano petition area. Rare but it will occasionally vibrate. Maybe the equipment that works the power cover? I also noticed a small vibe at times coming from the Pano petition area. Rare but it will occasionally vibrate. Maybe the equipment that works the power cover? Yup. The shade roller is the culprit and it is usually defective (as per dealer's shop foreman). I took it in and they replaced the whole shade assembly. Had to wait a while until the part arrived but it appeared to fix the issue! Said it before, and I'll say it again...love your hands on DIY style. One thing though, aren't the stock mids 2 ohms? I believe those CDT's are 4 ohm. If they match up power wise, I suppose the mids would be fine, but if they share a common channel with the tweeters (although you seemed to disagree with me on this point in another thread) the power to the tweeter will be decreased. 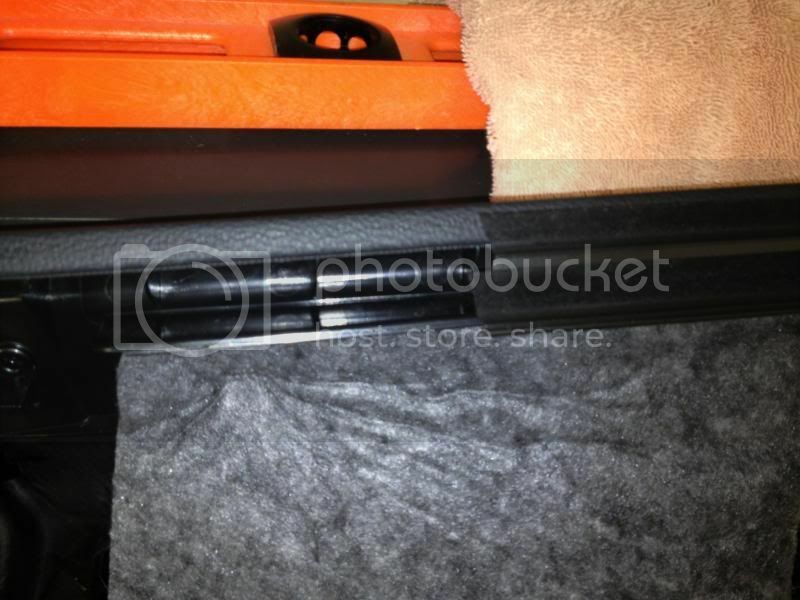 Looks like you used acoustic foam to seal reflecting waves between the speaker and door card. Is that working out well? The midrange is the only speaker I feel that needs some taming down, and your thread has given me the motivation to finally get on it. Your square peg and weather seal tips get two big thumbs up. I can finally re-affix my door panel correctly. Last edited by brauhaus313; 04-03-2013 at 03:41 AM. Harbor freight sells a pretty cheap riveter that has worked well for me. Not sure I understand what you mean by the decrease in tweeter power unless your thinking of series wired with mid? Anyway I wasn't really concerned about the factory drivers impedance, tweets 3.5 and mid 2 ohms, but more so on matching the efficiency ratings of the aftermarket units. I had no clue what the effeciency rating is on the oem stuff, so all I can do is match the aftermarket stuff the best I can. I also used an RTA to find out what frequency range the mids were running. Since I can't change this, I need to make sure I get a driver that can cover the range. I knew the OEM mid was small and knew it wouldn't go very low. I just needed something to play down to 450hz where my RTA was dipping down on the mid. My aftermarket tweets are 8 ohms and were quite a bit louder than the factory 3.5 ohm tweets. So the aftermarket units have to be a lot more efficient. Anyway if something was off I was prepared as I have a lot of different ceramic resistors I can use to attenuate a driver as needed. It so happened to really match up almost perfect. 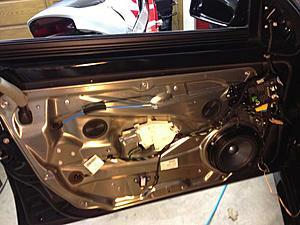 The deadening was critical to overall sound quality. It's just dead!!! No resonance, or overhand, extra colour, nothing that I had before. It just has a solid presence you don't hear in a vehicle very often. It's a pretty dead door originally but it did have some noticeable resonances that needed taken care of. Glad you were able to get some use out of this thread. Man you do great work... and document it too! Another awesome post by you, we appreciate it!!! I did nearly the same project on my '06 Mustang GT Convertible butbut yanked the entire interior, dynamatted (2 full boxes of the extreme) and replaced all of the speakers (I had put in a Pioneer F90bt years before). Now I've moved to OH and the pony sits while I drive my 2013 E350 4matic. When I yanked Ford's "Shaker 500" I found that the stock speakers were paper coned 25W MAX jokes made in China. The whole system added up to somewhere in the mid 200s, not 500 like they claimed. Can you tell me what the stock speakers were/ratings/maker etc? I have the HK that comes with the P1 package and wonder if I should look at upgrading. My only regret on the Mustang job I did was that I didn't do it sooner... won't make that error with my MB. I just tried to add some shots from when I did the Mustang, it's not letting me right now... I'll try back in a bit. Thanks man, and Happy Thanksgiving everyone! My guess is that Mercedes uses a plug type cable harness where the door is wired and there is a plug on the door jam, and one hanging from the door. That makes its easier to assemble since they just plug the door in. That also means it's going to be almost impossible to fish a wire through the stock wire loom. If someone can post a parts diagram of that area you'll be able to see if it is a plug or open.